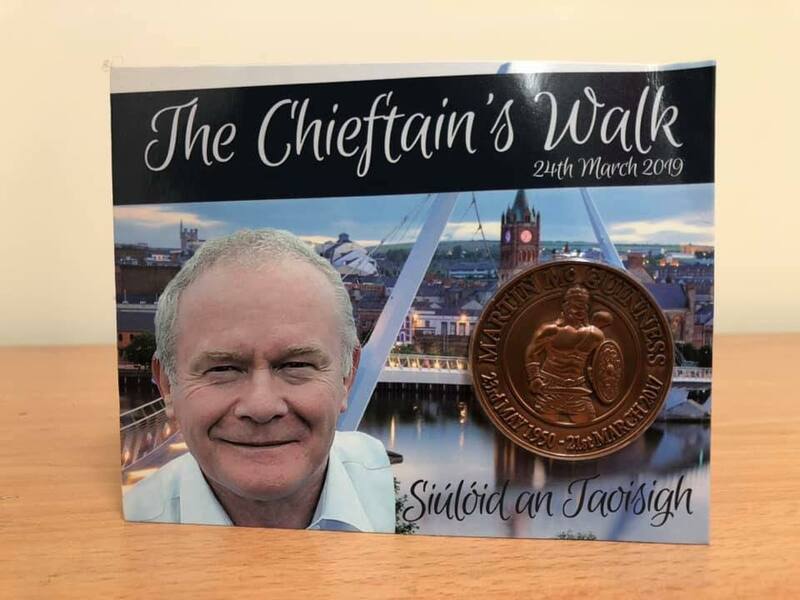 Recently we produced a number of commemorative coins for a local event called The Chieftan’s Walk. These were used to raise money for the Foyle Hospice in the memory of Martin McGuinness who was a prominent figure in Northern Ireland politics. His family were pictured in a local paper promoting the event alongside the commemorative coin which was used an incentive tool to encourage people to join the walk and then they would receive a coin in return for entering. You can see the picture and article below. coin features an image of legendary Ulster warrior Cú Chulainn and Free Derry Corner. Bernie Mc Guinness said: “Just like the medal last year, this will be a unique memento for everyone who registers to take part. “Obviously, only so many are being produced so signing up for the Chieftain’s Walk is the only way to guarantee this special keepsake,” she added. “All proceeds from the this year’s Chieftain’s Walk will go to the Foyle Hospice and the Intensive Care Unit at Altnagelvin Hospital, both considered fantastic facilities by the North West community. Last year’s Chieftain’s Walk to Grianan of Aileach, an iconic building in the Burt area of Inishowen which Martin was particularly fond of visiting, raised in the region of £30,000 which was a sensational effort. This year’s route, while not as demanding as the steep hill up to Grianan, will depart from Ebrington Square travelling to the Brandywell area. The regeneration of Ebrington was always high on Martin’s “to do list,” while his fondness of the Brandywell area, which houses both the Celtic Park Stadium and the Ryan McBride Brandywell Stadium, both sporting venues which he visited on a regular basis. Bernie McGuinness concluded: “Whether you are able to take part on the walk or not, the organisers of the event would encourage as many people as possible to sign up online as soon as possible, as both local charities will still benefit and those registered will receive the commemorative coin.” The 2019 Chieftain’s Walk will get underway this Sunday, March 24, at 1:30 p.m. from Ebrington Square and finish in the Brandywell area.